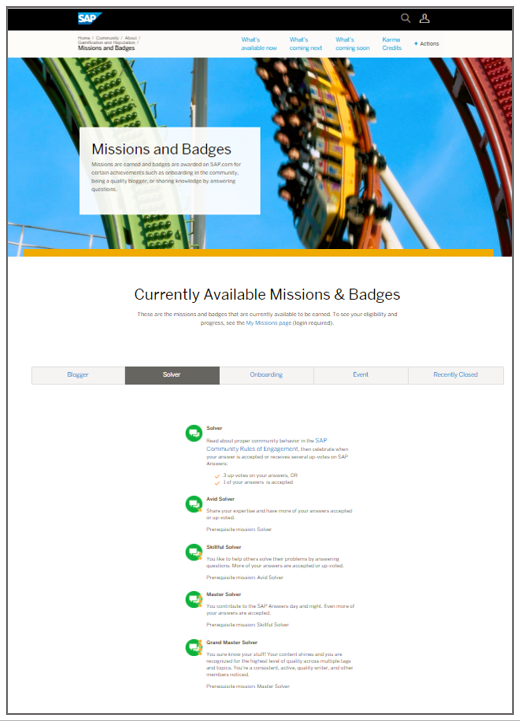 As the gamification and reputation lead for the SAP Community, I am excited to announce that our new mission set is now live! If you’ve been with us since the launch of the new community platform in 2016, then you know our mission set was designed and ready to coincide with the switch from SCN, but we needed to put it in “timeout.” That timeout is over and you can start completing missions today! This Tip in a Minute video provides a quick overview of how to get started. Detailed instructions and screenshots follow in the rest of the post. A mission is a virtual quest or challenge. When you meet the requirements of the mission, your achievement is recognized with a mission badge that is displayed in your profile for all to see. We designed the mission set to encourage quality contributions, help onboard new members, build bridges between our virtual community and events, and recognize outstanding members. The biggest change from the previous mission set is that you won’t receive points for completing a mission. But you will still get a badge as a reflection of your achievement. You can see the badges other members have earned by visiting their profile page and opening their reputation view as described above. You can learn more about available missions and how to complete them on the Mission Overview page, which describes the requirements and prerequisites to earn each badge in the set. For example, we introduced two new progression missions – Blogger and Solver. These missions recognize those who contribute high-quality blogs (Blogger) and answers to questions (Solver). Now I’ll let you in on a little secret… Some missions are hidden and therefore not listed on the overview page – that’s on purpose. These missions are meant to surprise you, and can be completed through positive behavior in the community and valuable contributions. Other missions are considered manual missions, meaning the badges are not automatically earned by meeting the requirements. 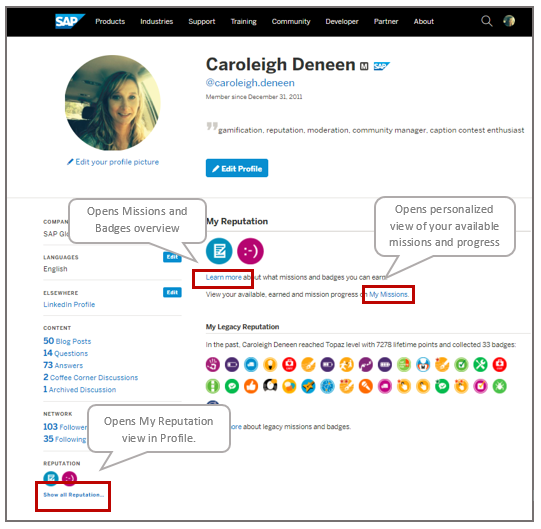 For example, the SAP Inside Track Speaker mission is a manual mission that requires the gamification team upload a file to assign the badges. If you are expecting a badge for a manual mission, but don’t see it, please be patient. We work as quickly as we can to award them, but sometimes it takes quite some effort to compile the relevant upload lists. 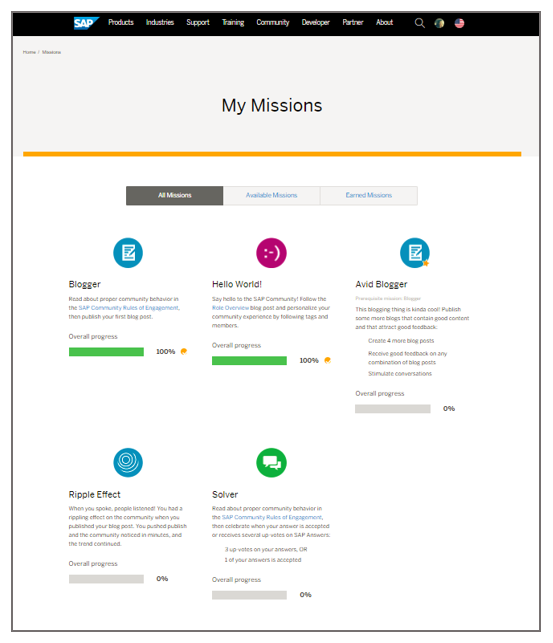 While the Missions and Badges overview page summarizes the overall mission set, your personalized My Missions page gives you information on the missions available to you based on any prerequisites you have met, your progress on missions started, and the list of those you have already earned. You can use the tabs to navigate to relevant views. If you don’t have any available missions, you have to trigger the creation of your player account. You can do that by taking any engagement activity on the community such as liking, commenting or updating your profile. 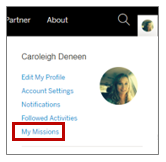 You can get to the My Missions page from either the My Missions link on the avatar flyout menu, or from your profile page when you are logged in, as shown above. When you complete a mission, you will get a notification in the notification stream and by email (if you have opted to turn email notifications on). When someone you follow completes a mission, that will also be included in the Activity Stream. If you’re new to the SAP Community, please read the SAP Community Rules of Engagement before contemplating how to earn missions. Regarding any previous mission progress and community contributions, this is a full mission reboot. No progress on the previous mission set, or action taken since the platform switch, counts towards the new missions. That said, some of you may find you already have new badges in your profile. That is because Member of the Month and Moderator Spotlight missions will continue in the new set, so members who have ever achieved these missions will see the corresponding badge(s) in their current profile — even if they earned those honors during the “timeout” of the mission set or before we switched platforms. In addition, we have tried to deliver on our commitment to award the event missions (e.g., SAP TechEd, App Space, and SAP Inside Track) that occurred during the timeout. If you don’t see your badge but were expecting one, please add a comment to this post. We will confirm participation and then upload as soon as we can. While some of the SAP Inside Track badges have been awarded for events that occurred while missions were in timeout, others will be awarded as soon as we receive the upload lists from organizers. Keep in mind, releasing missions is another step in the overall Reputation Program reload. Stay tuned, there is more to come! To all those who helped us get to this milestone, THANK YOU and GAME ON! Congratulation to SAP Community team and thank you for sharing this wonderful information with community. Indeed! And has Former Member heard? I’m sure she’ll want to see this in action. Yeah, nice to see missions back! It’s a little sad that past contributions (e.g. written blogs) don’t count towards the new missions, but I can cope with that! I’ll just come up with something new to write! PS: I’d like to make a pun with “mission critical” but I can’t come up with one – can anyone help me out?! Great news Caroleigh. Thanks for the update. Great Blog, Caroleigh Deneen ! I am glad the Missions are finally back ! Hi Caroleigh, thanks for the update. Looking forward to this generating positive engagement and participation in the community. Btw, any badges for TechEd 2016 speakers? Yes, 2016 TechEd speakers should have their badges. If we missed yours, I apologize. Let’s ask Sajid Amir to double check. Glad that missions are back. 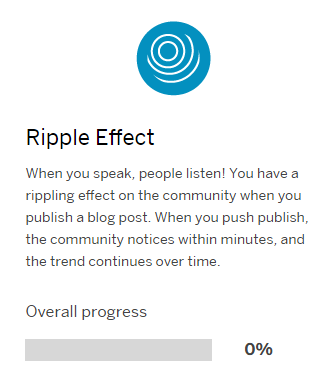 I published a blog yesterday (28th march), but still don’t see this badge activated for me 🙂 “Blogger” or “Ripple”. Could you check for the same. ? Nice blog, thank you for contributing. It looks like you published right before the mission go-live started… Can you confirm around what time and in which timezone you published? Thank you. Hi Tejas, I confirmed that publish time, yes it is CET. I’m afraid was a few hours earlier than the mission go-live on Wednesday. I’ll look forward to your next blog post! Shoot! Seems I published my most recent blog post just one day too early to make it eligble for a first successful mission. 🙂. Oh well, one more reason to come up with a topic for another one. For Missions like “Solver”, SCN should consider SDN top contributors who earned 20+ or 30+ badges and even currently, they are consistent, active, quality writer, and other members noticed, should be exempted and display “Grand Master Solver”. There is no logic in trying to get Grand Master Solver who proved already. Great !!! Good to see- missions back! Finally 🙂 Thanks for your message! Hopefully, this will help to bring some developers back to the SCN or make others stay. Hi Caroleigh Deneen , thank you for sharing all these great news with us! 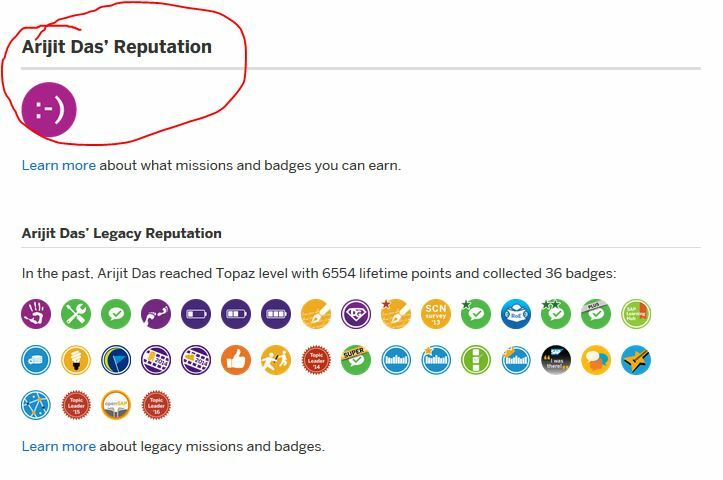 I am pretty sure that missions, badges and gamification are important parts of making the SAP Community engaging for so many people, so congratulations on your efforts! I want to please ask for you and Sajid Amir to kindly help me getting the badges for “SAP Inside Track Speaker 2017”, “SAP Inside Track Speaker 2018”, and “SAP Inside Track Organizer 2018”. I’m glad your excited to have missions back 🙂 Thank you for the information about the Inside Tracks you spoke at and organized. We are working on collecting the Inside Track data sets with the organizers and should be uploading soon. Sajid Amir will let you know when the event you reference have been uploaded (and if he needs help getting the data for the Ribeirão Preto event). I have just uploaded the requested badges to your account so they should show up on your profile very soon – Congratulations! Also Douglas, I will be reaching out to you separately via email regarding collecting any other information on organizers and speakers you may have for the 2018 event. can you help me understand how the progress indicator work?! While we would like to show a separate progress indicator for each sub-requirement, that is not presently possible (we have a feature request submitted with the product team). So the explanation is that it’s “less fine-grained,” and as you outline, each sub-requirement represents 33% of the mission progress. The indicator should increase 33% when each sub-requirement is fulfilled. The wording of the requirements becomes vague through the progression in an effort to reduce gaming, but you have captured the gist of the requirements well. Thanks for the explanation, Caroleigh! very nice mission and badges.. good start and we are enjoying it more. Thanks. Hi Joachim, yes, we are intentionally vague here. And to set proper expectations, I will note that this is a timed mission, so the progress has to be completed in a given time frame. If not, the mission resets so you can start over with the next blog. Good to see the missions back. My answer on a question (https://answers.sap.com/questions/471188/how-to-access-a-cell-of-a-crosstab-in-sap-design-s.html) has been accepted on 10th April, 2018, yet the mission Solver is showing 0% overall progress. 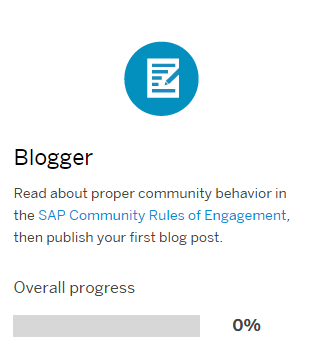 Of course I have read the SAP Community Rules of Engagement. We looked into this further and there is a delay in the relevant actions making it to the gamification service that awards missions and badges. Arijit Das I see that the mission is now shown as completed in the gamification service, but there is an issue with the push to the profile. We have a ticket open to address this. Thanks Caroleigh Deneen , it’s now showing as complete. I believe it should also display under the reputation section on my profile page where it is still missing. Hi Arijit, Thank you for reaching out. I see the accept logged, but not the mission completion. Let me look into this and get back to you. One question: I seem to be missing the TechEd 2017 participant badge. Is that something you guys can help me with? Thank you Morten. I’m sorry you were not awarded the badge as expected. Can you clarify, which venue – Vegas, Barcelona or Bangalore? Hi Caroleigh. I went to the Barcelona TechEd. Thank you! Any insights into whether there are any such gamification elements planned to be added to SAP Education products, ex: Knowledge Acceleration and/or Workforce Performance Builder? Hi James, I am not sure, but let’s see if Thomas Jenewein can provide insight. I know the SAP Learning Hub features a mission set, https://blogs.sap.com/2018/02/14/sap-learning-hub-news-february-2018/, but I don’t know about the products you mention. Is there a hidden/secret mission to receive a goat-badge? Colleen Hebbert get in here! 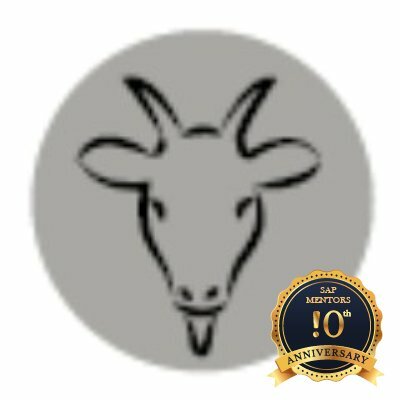 But wouldn’t it be cool to have our own SAP Community crypto-goat-currency. It could be mined through blogs and questions or some random way and allow members to give goatCoins to each other instead of upvotes. Mmm looks like GoatCoins already exist. So do CapraCoins. Gee feeling a bit slow to the crypto-uptake. Or gamification rewards gives out points or badges that users can then award to each other. You have to earn the right to give specific awards. Imagine earning the right to award the Goat! Susan Keohan get in here! Since Colleen tweeted me the other day (after I praised DBAs and Basis teams to the high heavens on Twitter!!!) maybe we can get CapraCoins if we show how we expressed our appreciation to these very unappreciated teams… This might inspire people to get creative in thanking their DBA and Basis teams… and the community could vote up the best ‘Thank you’ ? But I agree with Colleen and Lukas… Capracoins are a great idea! Thanks Caroleigh Deneen for sharing this helpful information. It says in the mission badges that if one of my answer is accepted, I will be receiving a solver badge. It’s been a month already. Please check. Upon reading this post and comments, it seems the timing did play a role here (i.e) it was accepted before the mission go-live started. So, no badge? You are correct, mission launch was March 28th, so if your answer was accepted before that it wouldn’t have triggered the Solver mission. Looks like you’ve been pretty active with answers this month. Keep it up! I’d honestly would like to know what exactly got me that?! It would be nice if you could click on the badge and the see which featured Content is referred here! Your blog post was recognized by the SAP Community as a high-quality contribution and selected to be featured in our bi-monthly feature. Still I don’t recall which blog post got me this!? …and I probably got the badge now, because it was only recently introduced.